Acupuncture is a method of relieving pain and dysfunction by encouraging the body to promote natural healing and improve its functioning. It is performed by inserting needles and applying heat or electrical stimulation at various acupuncture points in the body. The classical Chinese explanation is that channels of energy called meridians run through the body and over the surface like a river irrigating and nourishing the tissues. A blockage in the smooth flow of energy within the meridian will result in an excessive amount of energy in some part of the body and a deficiency in others, resulting in different illnesses. 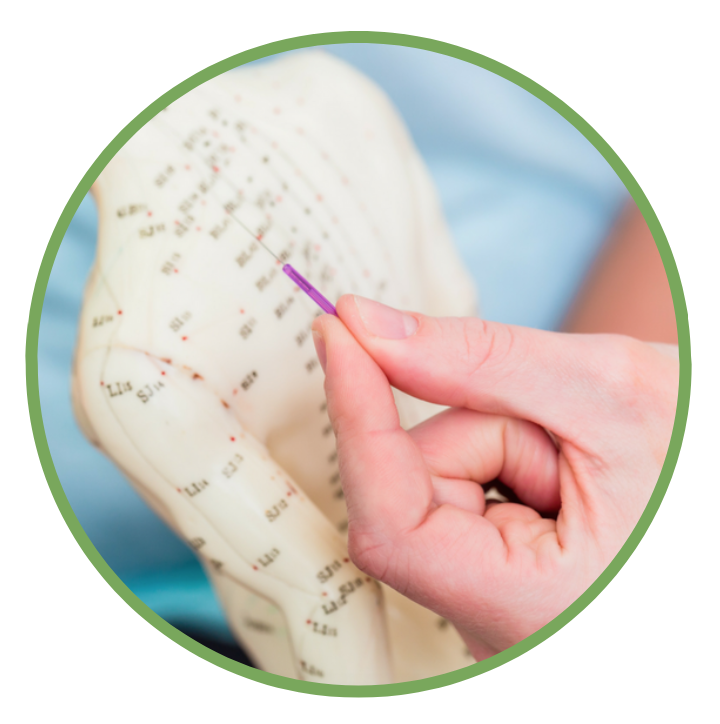 The normal flow of energy can be re-established by needling the acupuncture point, which unlocks the obstruction and allows energy to circulate smoothly throughout the meridians and the entire body. Acupuncture treatment can help the body’s internal organs correct imbalances in digestion and absorption to promote optimization of their activities. Modern science explains that the needling of acupuncture points stimulates the nervous system to release chemicals in the muscles, spinal cord, and brain in addition to affecting the immune and endocrine systems. The chemicals will either change how pain is experienced or trigger the release of other chemicals and hormones that influence the body’s own internal regulating system. The improved energy and biochemical balance acupuncture produces serves to stimulate the body’s natural healing abilities. The result is enhanced physical and emotional well-being. To keep good notes concerning your personal response to the treatment and provide this feedback at the next treatment session. What Are The Effects of An Acupuncture Treatment? As the energy is redirected in the body, internal chemicals and hormones are stimulated that encourage healing to occur. The patient can experience a sensation of deep relaxation or even slight disorientation immediately after the first few treatments. These side effects will pass within a short time after resting. Other indications that the acupuncture is producing positive results include modification of appetite, sleep, and elimination of emotional patterns. A slight worsening of the initial symptoms occasionally occurs for a short period. Often people are interested in acupuncture, but are afraid of needles. However, the insertion of the tiny filament needles used in acupuncture is virtually painless. Brief needling sensations vary from a pinching or stinging sensation to feeling of numbness or distention and are a sign that the treatment is having a positive effect. In the United States, acupuncturists are required to use sterilized, disposable, stainless steel needles, and follow “the clean needle technique” to avoid any risk of infection. Acupuncture has been the main medical system used for thousands of years in Asia. It is now practiced widely throughout most of the world. Acupuncture can be used to complement and enhance conventional Western medicine. Belief in the therapy is not a factor that will influence treatment outcome. In recent years objective clinical studies have noted significant modifications in the digestive, respiratory and circulatory systems after acupuncture treatment. What Are Other Oriental Medical Techniques Used? Electro-acupuncture: Like regular acupuncture, electro-acupuncture uses needles inserted by hand, however the needles are connected to a very low-intensity electrical current. Electro-acupuncture has a stronger effect than traditional acupuncture. Heat: Heat from an infrared lamp is applied over acupuncture needles to enhance effect. Heat therapy restores balance, relieves inflammation, and eases pain. Moxibustion: Moxibustion is an analgesic technique in which moxa, a substance derived from the leaves of wormwood plants, is used as a source to warm acupuncture needles to stimulate blood circulation and energy toward acupuncture points. Cupping: Cupping is an ancient Chinese practice that employs a rounded glass cup that is placed on the skin. Pressure is created within the cup that draws the skin and superficial muscle layers outward, easing acupuncture points deeper in the body. This therapy is particularly effective for muscle tension and pain. Auricular Acupuncture: Auricular Acupuncture is acupuncture done on the ear. It is one of the more widely used microsystems to treat conditions. Microsystems use one aspect of the body – such as the ears, hands, or feet – to treat conditions that are present anywhere in the body. Gua sha: Gua sha is the application of repeated pressurized strokes over lubricated skin using a round-edged instrument. The technique is most commonly used to treat asthma, muscle and tendon injuries, poor blood circulation, headaches, and other minor problems. Qigong: Qigong is a meditative technique in which breathing patterns are coordinated with body postures and movement. As part of traditional Chinese medicine, Qigong directs the flow of “energy fields” vital to the body. It uses techniques including deep breathing, concentration, and relaxation to help restore and maintain proper energy balance to the body. Qigong can be used as a therapeutic intervention but is also considered a good preventative health option. Shiatsu: Shiatsu is a Japanese word meaning “finger pressure.” Shiatsu uses hand pressure and manipulative techniques to adjust the body’s physical structure and its natural inner energies to help ward off illness and maintain good health. Tuina: Tuina is Chinese for “poke-pinch.” It is a hands-on body treatment that brings the body into balance through acupressure and joint mobilization.